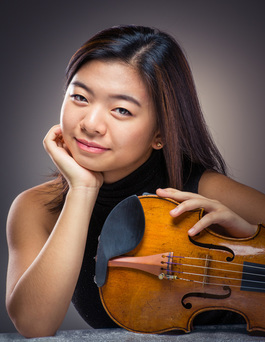 Sixteen year old violinist Karisa Chiu is a Fellow Laureate at the Music Institute of Chicago's Academy program where she is studying the violin with Almita Vamos. She began playing the violin at the age of three with her father Cornelius Chiu. She is a winner of many competitions including first prize at the 2016 Blount-Slawson Young Artists Competition and fourth prize from the 2015 Cooper International Competition. She also won first prizes from the Montzka Young Artists Competition, the Musician's Club of Women Scholarship Audition, the Society of American Musicians Competition, the Sejong Music Competition, the Chinese Fine Arts Society Competition, the DePaul Community Music Concerto Competition, and the American Opera Society scholarship audition. She was also a two-time winner of the string category in the open junior division at the Walgreens’s National Competition. Karisa has been featured as a soloist with the Montgomery Symphony Orchestra, the Kishwaukee Symphony Orchestra, the Northbrook Symphony Orchestra, the West Suburban Symphony Orchestra, the Oistrach Symphony Orchestra, CSA Sinfonia, and the University of Illinois at Chicago Orchestra. She is also invited to perform with the Elmhurst Symphony Orchestra in 2017. She has played in master classes given by renowned artists such as Ida Kavafian, Pamela Frank, Mauricio Fuks, Joel Smirnoff, Ilya Kaler, and Dora Schwarzberg. As a chamber musician, Karisa has won many competitions including Gold Medal from the Saint Paul String Quartet Competition, the Discover Chamber Music Competition, the Silver Medal from the Pearl G. Barnett Chamber Music Competition, thee Honorable Mention prize from the Fischoff National Chamber Music Competition, and first prize from the Jules M. Laser Chamber Music Competition. Karisa is currently home-schooled and enjoys biking and drawing in her spare time.